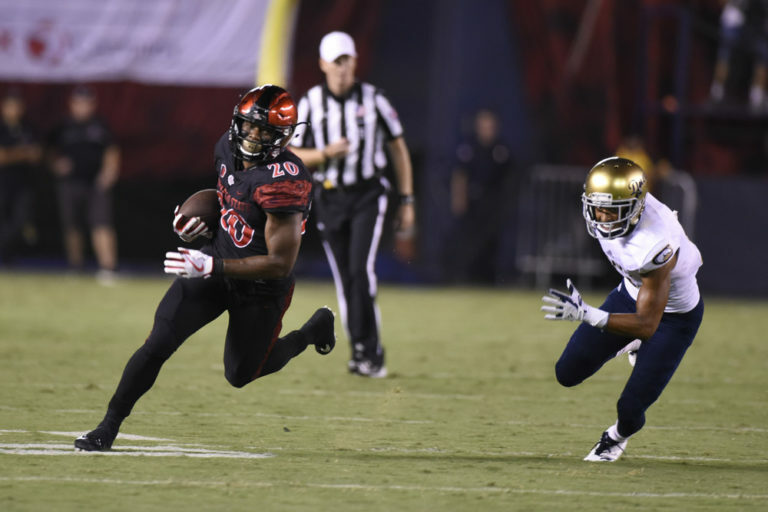 Despite having more than 2,000 yards rushing this season, San Diego State’s Rashaad Penny wasn’t one of the Heisman Trophy finalists announced Monday night in New York City. Instead, Louisville quarterback Lamar Jackson, Stanford running back Bryce Love and Oklahoma quarterback Baker Mayfield were the three finalists for the 83rd annual Heisman Memorial Trophy. Penny is the current leader in the FBS in rushing yards (2,027), rushing yards per game (168.9), all-purpose yards (2,698) and all-purpose yards per game (224.8). He became the 29th person to break 2,000-yard rushing mark on Nov. 24, the Aztecs’ last game of the regular season against New Mexico. Long predicted that Penny won’t be a finalist because he plays for a Group of 5 team, and therefore are overlooked by voters. Penny was also snubbed by the Maxwell Award and the Doak Walker Award last month, which goes to the best running back in the country. “Whether it was the Doak Walker Award or the Heisman Trophy, it’s supposed to reward the best player in college football,” Horton said. “Whether some people think he is or isn’t, obviously we think he is, but to not even be in the final selections for either award — I just want to know what the criteria is and what it’s based on. Maybe some people here got a chance to vote on the thing, maybe I didn’t see the fine print about if you’re from a non-Power 5 conference school it really doesn’t matter. After the New Mexico game, Penny said he wasn’t bothered by the snubs. The Heisman Trophy winners and finalists are selected by 929 voters in six regions, Northeast, Southwest, South, Mid-Atlantic, Midwest and Far West, which included 870 media members and 58 former Heisman winners. The public is given one overall fan vote through the Nissan Heisman House. The Heisman Trophy winner will be announced at a ceremony on Dec. 11 in New York City.